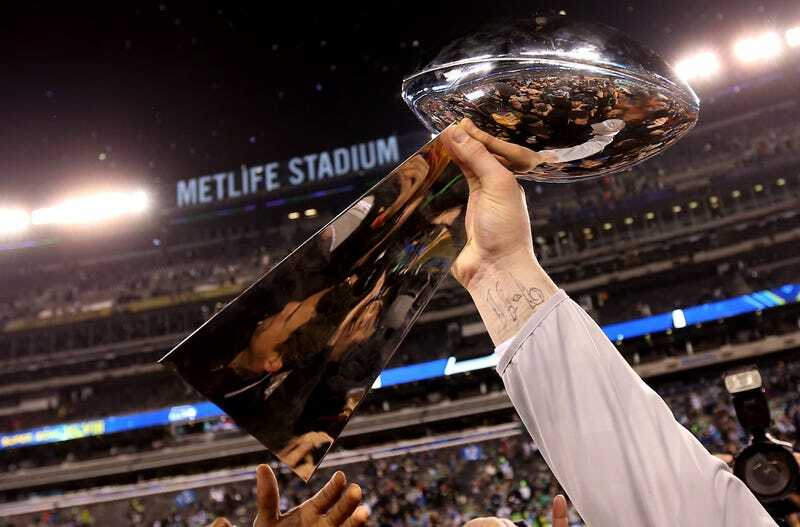 One photo taken immediately after Super Bowl XLVIII shows an unidentified Seattle Seahawk—with a "9/11" tattoo on his wrist—holding the Lombardi Trophy. One tipster asked if the ink belonged to head coach Pete Carroll, which would be interesting, considering his thoughts on the September 11th attacks. It isn't, but we believe we know who it belongs to. Is Pete Carroll A 9/11 Truther? Carroll isn't wearing the same jacket and doesn't have a hat. But let's go deeper and find out who has the tattoo. The player on the left with his hand on the trophy is Jared Smith, a rookie lineman on the practice squad. He's the only white guy wearing that type of sweatshirt to appear on camera. There's another shot with him later, right next to the Lombardi Trophy. At some point, the Getty photographer presumably snapped a photo of Smith raising the trophy. On his Facebook, he doesn't have a photo of the wrist tattoo, but he does have a huge American flag/bald eagle sleeve on his upper arm, along with other ink all over his arms. The "9/11" tattoo would be interesting if it was on Carroll, the truther, but it doesn't; it most likely belongs to a patriotic practice squadder. Obscure theory: busted.